(Newser) – President Trump on Monday said he would decide how to respond to a suspected chemical attack in Syria within 48 hours, reports the Hill. 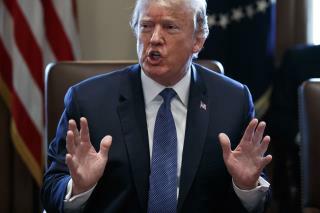 Trump had previously condemned the "animal Assad" by tweet over the civilian deaths, but he addressed the matter in person Monday with reporters. “It was atrocious. It was horrible,” said the president. “This is about humanity and it can’t be allowed to happen.” Trump said he'd be meeting with his national security team—including new national security adviser John Bolton, who starts Monday—to figure out the next steps. “If it’s the Russians, if it’s Syria, if it’s Iran, if it’s all of them together, we’ll figure it out,” he said. Democrats will force Trump to do nothing but maybe "impose sanctions" (if that). The Russians are saying the chemical attacks are fake News. Really? So all those babies gasping for air & foaming at the mouth was all an act? Clinton and Obama had Gaddafi killed; why shouldn't Trump wipe out that maggot Assad? Kill his murdering, sorry a$$ and put him in the ground.